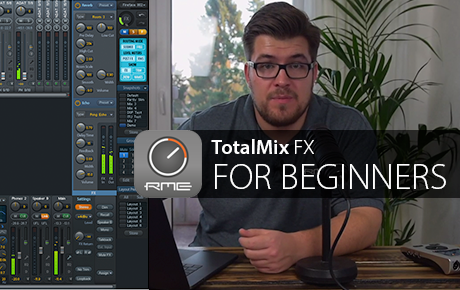 RME have launched a new video series aimed at introducing new users to the power of mixing and routing with TotalMix FX, RME’s software controller included with all RME audio interfaces. This series will help you get the most out of recording and producing with your audio interface, with RME’s Adrian Lehmann taking you step by step through features like routing, customizing the channel layout, and creating your own custom workspaces. TotalMix FX is included as part of the driver, so after you’ve downloaded and installed the latest driver and connected your interface, the mixer window will open automatically. If you’re new to TotalMix FX, you may find the number of options available to you somewhat overwhelming at first. Rest assured though, once you get to grips with the basics, you’ll find TotalMix FX to be simple, intuitive and incredibly powerful. You can also route your outputs back in as inputs with TotalMix FX’s Loopback function, and analyse your audio signals with RME’s additional free software DIGICheck, a suite of analysis tools that provides detailed information such as level metering, frequency response, stereo width, phase correlation and bit distortion. On top of this, you can even control your interface from another computer, including wirelessly with an iPad, by using TotalMix Remote – scroll down for the Quick Start Guide. If you’d like a more detailed introduction to TotalMix FX, check out the Synthax Audio UK tutorials on our own YouTube channel, where we go more in-depth into the many different functions available in this incredibly powerful mixing, monitoring and routing controller. 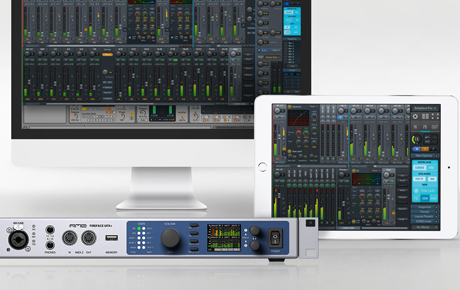 TotalMix FX allows you to route audio from any of the inputs of your device to any of its outputs, with zero latency. including channel routings, levels, EQ and FX settings. to quickly switch back and forth between two sets of studio monitors. vocals on Mic input 8 for example, you can make things easier by renaming it ‘Vocals’. stereo and phase information (spectrum analyser, level meters and vector scope). TotalMix Remote is a free companion app for TotalMix FX that allows you to control your RME interface over network, giving you the option to monitor and mix from a different computer to the one your interface is connected to, including over Wi-Fi. You can even use an Apple iPad, for wireless touch-screen control when you’re playing a venue or working in the studio. 1 – Download and install TotalMix Remote on the Remote computer (or iPad) you want to control your interface from. 2 – On the Host computer (the one which your interface is connected to), open TotalMix FX and select Options from the program’s file menu, then select Network Remote Settings (on a Mac), or Host Connection Settings on Windows. This window will also provide you with the Host computer’s IP address. 3 – Check that the Enable TotalMix Remote Server box is ticked. On Windows, you will also see a Firewall warning – make sure you allow TotalMix Remote. 4 – Make sure that both the Host and Remote computers / iPad are on the same network, then open TotalMix Remote*. A dialog box should open automatically (for entering the IP address and port number), but if it doesn’t you can also click on the Search Connected Hosts option. *On an iPad, tap on the gear symbol in the upper right corner, then on Host Connection Settings. 5 – In the resulting dialog box, type in the Host computer’s IP address (e.g. 192.168.0.101), and make sure that Activate is ticked. The port will usually default to 7009 (and should be left as this), however if the port is occupied for some reason an error message will show, in which case simply choose a different port. This will bring up an additional Firewall warning – again, allow TotalMix Remote to enable it. 6 – Click Done or OK, and TotalMix Remote will open within a few seconds. You are now free to control your audio interface from your Remote computer or iPad! If you’d like to know more about any of RME’s pro audio products, give us a call on 01727 821 870 to speak to one of our team or to arrange a demo.